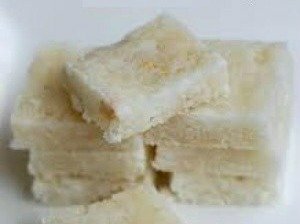 Coconut Burfi is an easy to make sweet and a quick recipe too. It is called 'khobbri mithai' in Kannada and 'naralachi vadi' or 'khobarychi vadi' in marathi. You can have coconut barfi as a dessert or as a sweet snack or just like that to satisfy to your sweet tooth. Narial barfi has a shelf life of about 10-15 days so you can make in advance and keep it ready to serve when needed. In hot summer days you can keep it for about a week. Tenga barfi can be kept longer in the fridge. There are a few different recipes to make this sweet and this is one of the easiest burfi recipes. You will also find the tips below, in case you do not know when exactly to take the coconut mixture off the flame to get a perfect narial burfi. 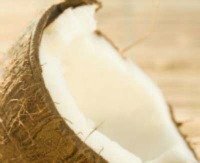 Coconut sizes can differ and depending on the maturity of the coconut, you get less or more coconut meat. So it is better to measure the grated coconut and take sugar accordingly. Heat ghee, keep flame low. Fry the cashew pieces in ghee. Do not let them brown. Grease a plate with a little ghee. Keep aside. In a thick bottomed pan, mix grated coconut and sugar. Put on the stove.Keep the heat medium and keep stirring. The sugar will dissolve and the mixture will become a bit thin. Keep stirring once in a while. After about 10 minutes, when the mixture starts thickening, reduce the flame. Keep stirring and scrapping the sides of the pan. When it starts leaving the sides of the pan, add the cardamom powder and mix well. When the mixture is ready, pour it onto the greased plate. Spread it immediately into about a 1 cm thickness. Sprinkle the cashew nut pieces on the top and press a little. Cut into squares or diamond shape as you like. Let cool completely. The coconut Mithai is ready to eat. Store in a container and keep in a cool place. No need to store it in the fridge if you are planning to finish it off within a week. You can keep this for about 2 weeks in cool weather. In hot summer weather, you can keep it at room temperature for about a week. 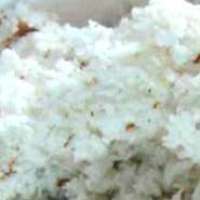 When you grate coconut for this recipe, grate and use only the white fleshy coconut meat. You will get nice white/pinkish color. Do not use the last brown covering part of the coconut for the burfi. That will change the color of the burfi. The trick in making burfi is to know the right time to remove from the flame. So pay attention there. If you take the pan off the fire too early, the burfi mix will be too soft and will not set. If you take it off a little late, the burfi mix will be too dry and will crumble and will not retain the shape you want. Troubleshooting - What to do to get the burfi consistency right. Coconut burfi is quite forgiving and it doesn't want you to fail. It is just a matter of practice to know the right moment. In case the burfi mixture is too soft when you take the coconut mixture off the fire, and it doesn't set even after cooling, it means you have taken it off a bit too early, just return it to the pan and cook some more. In case the mixture becomes too dry and crumbles even before you flatten and cut, return to the pan. Sprinkle a spoonful of milk (not too much) and cook again till you get the right consistency.